Nicole and Mac are bound together by his words. The more she reads, the closer Nicole feels to Mac, a man she has never met. Both are dealing with loss. Life has ceased to be purposeful and the future is unknown. “It’s all about working out a future without people you’ve lost, imagining… what they would want for you.” Death seems so final. The face you long to see, the arms you long to hold are no longer there. The future seems bleak. The novel is about searching. Searching for a new meaning in life. Searching for past memories that are hidden somewhere inside. Searching for the truth. Mac has been searching for happiness all his life. The war years shaped and changed him. Nicole too is searching for a lost happiness. Her relatively happy and stable life is a thing of the past, she is struggling in her new life. The novel is written in two styles – every other chapter is in the third person from the point of view of Nicole. The alternating chapters are in the first person of Mac. I got totally engrossed in both of their lives and was able to empathise with both of them. Present day action was set in Henley. The war years moved from Mac as an eighteen year in 1943 as a soldier in Italy to the concentration camps of Auschwitz and Bergen Belsen. The details did not make for comfortable reading but it is important that everyone knows the truth about what happened in the camps. We owe it to the survivors and we owe it to the six million innocent men, women and children who perished. Rosa’s Gold also has the theme of friendship. Mac formed bonds of friendship during the war. Nicole is searching for new friends. 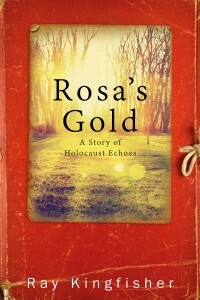 I found Rosa’s Gold a compulsive read. It could have been a gloomy book due to its subject content but I actually found it a very positive and hopeful read. “Sometimes you just have to put your losses to one side, see the sun still shines, and force yourself to smile up to it.” It is a work of fiction but contains factual details of life in the camps. I stumbled across Rosa’s Gold by accident as a free Amazon kindle download. It is a brilliant work of fiction. I now intend to seek out more by Ray Kingfisher. He is definitely my ‘find’ of 2016 and I can highly recommend Rosa’s Gold to you.